Thermal imagery is a game of correlation: we use long-wave infrared radiation to give us insights on the temperature profile of the field, but we can also make correlations to other weather-sensitive metrics such as grain moisture and anaerobic zones. This spring has been particularly wet for Illinois, pushing planting dates back as we wait for fields to dry out and warm up enough to plant. Aerial analysis can provide value before the first seed is even in the ground. AgMRI’s thermal images may be able to help you organize your early season operations and manage 2018 planting with confidence and efficiency. Thermal imagery is a game of correlation: we use long-wave infrared radiation to give us insights on the temperature profile of the field, but we can also make correlations to other weather-sensitive metrics such as grain moisture and anaerobic zones. One of our biggest epiphanies from the spring of 2017 was the ability of thermal imagery to help determine soil moisture – alerting you to wet spots and letting you know which fields are dry enough for equipment traffic. Oftentimes, a field will appear ready to plant with a quick check around the field edges and/or through the middle but once you start running the planter through the field, unknown wet areas can result in avoidable replant zones, compaction issues, and equipment stuck in the mud. AgMRI’s thermal imagery can not only help you avoid issues in a specific field, but can also help make management-timing decisions across your entire operation! By arranging your fields in order of their average thermal reading, you can get at-a-glace insights as to which fields are ready for planting, spraying, and other pre-season activity. When the season begins, don’t let yourself be stuck in the mud. Use AgMRI’s thermal lens paired with our unique sorting features to get the 2018 growing season off to a great start! Al Eisaian is the Co-founder and CEO of IntelinAir, an aerial imagery analytics and artificial intelligence company focused on global agriculture industry. IntelinAir was recently named one of the 7 Ag Tech Start-Ups to Watch in 2018 by Agriculture.com. IntelinAir’s AgMRI platform, the leading aerial imagery analytics solution for agriculture, alerts farmers to emergence issues, early-season weeds, nutrient deficiencies, weather damage, water stress, disease outbreaks and insect infestations, giving farmers the ability to make proactive, data-driven decisions throughout the growing season as well as learnings for the next growing season to increase profits. Learn more at www.AgMRI.com. IntelinAir will be featured at the World Agri-Tech Innovation Summit March 20-21, 2018 in San Francisco, California where Al Eisaian is scheduled to speak. More information can be found at www.worldagritechusa.com/speakers. Looking back at 2017, what were some of your key takeaways in the agriculture industry? (Al Eisaian): Farmers are becoming very aware of the importance of leveraging data and being data-driven in their operations. In addition, our industry witnessed massive consolidations like Bayer acquiring Monsanto, Dow Chemical acquiring DuPont, and ChemChina acquiring Syngenta, as well as many other industry movements. Farmers are now somewhat at a disadvantage due to these massive consolidations and reduction of competition. Additionally, as the data revolution becomes more and more vital for the operation of healthy enterprises, farmers are learning that they must embrace modern and data-driven technologies or fall behind. Another takeaway was the advantages of investing in technology. Farmers who are able to invest in the right type of technology are growing and acquiring more leases or land over farmers that are not investing. There is also massive pressure on the commodity prices resulting in the failure of smaller farming operations while larger operations, investing in technology, are acquiring those smaller operations. Lastly, agricultural countries like Brazil and Argentina are becoming stronger every year and are competing effectively in the world markets with farmers in the United States. Our crops are globally priced commodities and those prices are set by this global competition. Improving our efficiency and reducing our labor and input costs by using modern technologies like aerial analytics is a huge advantage for us as competition continues to grow. The U.S. farmers have always been earlier adopters of technology and that is their advantage. At IntelinAir, I’m looking forward to the increase in the acres we’re monitoring and the amount of interest we’ve seen from farmers wanting to become more data-driven. In addition, our team has greatly improved our AgMRI technology and service from our 2017 season findings. We are introducing a significant improvement in our ground resolutions going from 6” (15cm) resolution to 4” (10cm) resolution per pixel which enables us to provide a whole host of additional value that was not possible at the 6” resolution. Secondly, AgMRI’s service has improved in insight, accuracy, and timeliness allowing farmers to address rapidly critical problem areas before they become bigger. I’m also looking forward to our deep integration with John Deere where farmers can leverage AgMRI’s insights inside of the John Deere Operations Center and their MyJohnDeere account making it easier for farmers to analyze the insights and take action on the findings. Why should farmers embrace aerial imagery analytics technology and what do you believe are the consequences of not doing so? With aerial imagery analytics technology, farmers now have 100% coverage versus just field scouting based on a sample size. If a farmer’s sample size is 100% of their fields, they now have a birds-eye and bugs-eye view of their operation. The birds-eye view is the ability to see across all of their farms throughout multiple locations simultaneously which is a huge value. At the bugs-eye view, when AgMRI runs the image analysis, farmers are able to view very localized issues like weeds, emergence issues, traction programs, and more. The ability to view everything at once, continuously throughout the season, provides farmers the ability to make better decisions. They can now deploy people and equipment where they are needed most. Having this level of prioritization and understanding of issues farmers can address, automatically translates into profits and running a better enterprise. 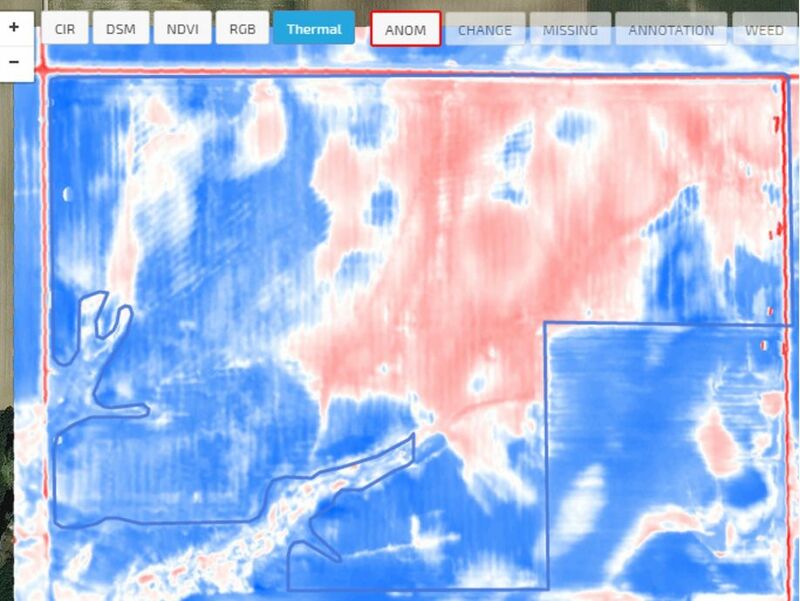 In addition, the ability to have early warnings for situations like aggressive or resistant weeds, water damage for irrigated or tiled farms, or the ability to harvest properly with AgMRI’s thermal decision maps, all help the farmer’s return on investment. At IntelinAir, we call this the “Power to Know” and the “Power to Act.” This technology helps farmers spend more time addressing issues and less time looking for them. Instead of spending 80% of their time looking for issues and 20% addressing them, farmers can now flip those percentages with the help of AgMRI. Beyond this, AgMRI allows farmers to collect data regarding the performance of their crops throughout the season that can be correlated to the yield map and other data layers. This provides valuable information to make more informed, better strategic decisions to ensure continuous improvement season-on-season. For example, management zones, hybrid selection, and nutrient prescription are all areas where farmers can use AgMRI data to understand better what is going on in their fields. If farmers decide not to embrace modern data-driven technologies then they are simply going to fall behind competitively with farmers that do. Humans are unable to find every issue while farming thousands (tens of thousands or hundreds of thousands) of acres. And it is humanly impossible to process thousands and thousands of images. Analyzing the vast number of high-resolution images leveraging artificial intelligence and powerful computer processing is the best way to turn images into insights and deliver profitable actionability to farmers. Five years from now, where do you see the ag-tech industry? While the march of technology continues to accelerate, I’m very excited about three things happening in the ag-tech industry in relation to aerial technology. The first thing I’m excited about are aircraft that can be operated very cost effectively while covering millions of square miles with high-resolution. Airbus has unveiled their plans for pseudo-satellites, which are essentially high-flying drones equipped with sensors, allowing them to fly 50,000-70,000 feet above the ground and cover millions of acres per day. This is very exciting because if you want to cover 100,000 acres today and capture ultra-high-resolution imagery (10cm per pixel or better), a manned aircraft needs to fly all day to capture that amount. Five years from now, imagine a couple of pseudo-satellites covering tens of millions of acres. The second thing I’m excited about is the increase in the number of satellites companies are deploying. In addition, the government has relaxed specifications on satellite imagery. Just as recently as last year, the U.S. government specification was limited to 50-centimeter resolution which was relaxed to 25-centimeter resolution late last year. DigitalGlobe, following the relaxed government specification, will have a service by 2020 that will capture images at the 25-centimeter resolution. This recent change is excellent for us because we can leverage satellites in the future to answer certain types of questions that will add value to a farmer’s operation. Camera technologies are also improving while becoming cheaper and more available. This allows aircraft to pack more sensors and powerful cameras while we can obtain data at a better cost. I’m also excited about the increase in computing power. Amazon Web Services, Google’s Cloud, and Microsoft’s Azure are all competing to deliver lower-cost processing and storage. The speed of which data is processed will also improve. These improvements in computing over the next five years might enable us to actually do a lot of the computational work aboard the actual imagery acquisition vehicles and speed up the delivery of our insights to farmers to near real-time versus the current 24-48 hours turnaround time. Finally, I’m excited about the robotization of farming. John Deere and other large manufactures are rapidly investing in robotics to make sure we’re farming at the plant level and not the field level. We’ll be able to increase yields and address disease and other issues much faster so we can increase production and yields. I’m seeing that farmers who are investing in this type of technology early and are willing to learn and grow with it, are going to win.